You don’t have to travel too far in Italy to find a spectacular hill town but Civita is more than just a little bit breathtaking when first viewed. It lies in close proximity to the town of Bagnoregio about 80 miles north of Rome in the central Italian region of Lazio adjacent to Umbria. 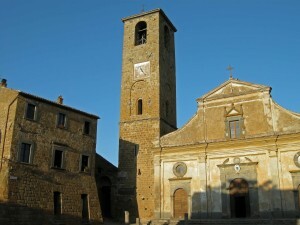 Founded by the Etruscans over 2500 years ago, Civita was the birthplace of Saint Bonaventure who died in 1274. His boyhood home has long since fallen off the edge of the cliff as the town has dwindled in both area and population, to approximately 15 residents, over the course of the 20th century. It would not be the ideal location during one of Italy’s many earthquakes, one of nature’s forces responsible for turning this town into an island in the sky. 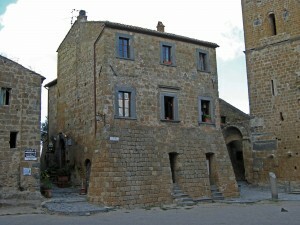 During Etruscan times the town held a superior military advantage with its location high above the neighbouring towns and villages. The word of mouth communication system in place was nothing short of amazing as messages were relayed verbally from tower to tower, town to town in about 7 minutes over a distance of 25 miles. This incredible speed in those days was totally unnecessary because when advancing troops were spotted by the watchman in the tower, often a highly respected village elder, they still had days before the enemy reached the village walls. I began having images of Monty Python’s search for the Holy Grail right about now. The drive from Tuscany through Umbria was wonderful as the countryside opened up and suddenly became more fertile with the hills more gently rolling and huge mountains rising up from the valley floors to the south and east. We arrived in Bagnoregio around noon with our GPS being quite good for a change but somewhat unnecessary as the signage was excellent. We stopped to make a phone call to the B&B in Civita where we would be staying to find out exactly where it was. I knew it was near here but somewhere on a hill and I didn’t see any hills nearby – boy was I in for a surprise. We saw a “bus to Civita” and knew we were close but we stopped again and Karen got some more directions on the phone from the B&B but we still weren’t sure. Do we park in town somewhere and take a bus? That’s the vibe we were getting but I seemed to remember from Rick Steves’ book that you park at the base of the cliff and walk up so we drove a bit more and got one more set of directions. Go to the arch, keep right, then straight, yeah, I’ve had those kinds of directions before. Fortunately, as we were driving somewhat aimlessly around we saw a sign to Civita and following its arrow got us to the parking lot at the base of the cliff. Now that’s a hill town! Rick Steves advises to approach Civita with the respect and sensitivity you would a dying relative because in a sense that is what the town is like. It sits precariously high above the Tiber River atop a wind and erosion corroded cliff. 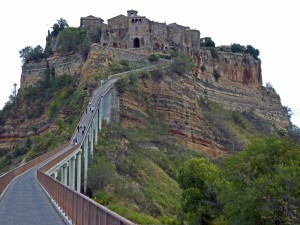 At one time Civita was connected to Bagnoregio but that spine of rock has long since disappeared replaced today by a footbridge and path climbing from one town to the other. Hard working residents on Vespas and in tiny trucks do the work their fathers did with donkeys bringing supplies for Civita from Bagnoregio below. We had to do some repacking in the parking lot because we could only take what we could carry. I felt like a bona fide dork dragging my small suitcase on wheels up the hill. The hike up was very steep but only about half a mile and not bad at all. At the top I felt like we were walking onto a spaghetti western movie set as we entered the piazza through a cut in the rock wall made by the Etruscans centuries ago. 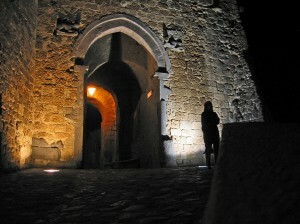 The smooth cobblestone walkways and the ancient stone buildings are living history. Don’t look for arcades or televisions, movie theatres or fancy restaurants; there are no museums or department stores, there are not even cars, just a church, a tower and an open, dirt square surrounded by cobblestone walkways. This is Italy and it is fantastic! The owner of the B&B greeted us after we checked in. We were offered a room with 3 beds but no bathroom. The bathroom was 2 doors down the hall and, not thinking, I said we preferred a bathroom in the room so we were escorted to a smaller room next door. I said not thinking because I should have asked, as it turned out there was only one other couple staying in the inn tonight so the bathroom would not have been an issue. For once, I made a mistake. If this room were anywhere else, like in the U.S., I’d dislike it immensely, but here it is so cool because this town is so different. The room is small, not much space to move around in and the armoire, which we had to fight to open, took up a good part of the room. The windows had no screens so we had to be careful of bugs coming in but still, there was something about this ambiance that I just love. We took a quick walk through this unique village after lunch. Friendly wine cellars, a rustic bruschetteria and an old olive pressing mill, all private property despite the fact that we would have sworn many were abandoned. It was all made that much more charming by the fact that absolutely no one was around. 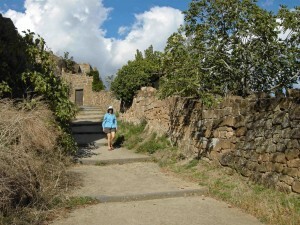 Our walk led us to the end of the village where the main pathway we were on changed to a set of steps and a dirt path leading downhill past some small Etruscan caves one of which is actually a chapel cut deep into the rock. It may have originally been a tomb and at one time used as a jail; either way it was not your typical roadside attraction so we found it very intriguing. From there we also were rewarded with a spectacular view of the eroded canyons surrounding this mystical hill town. We hiked further on down the trail thinking it would take us down to the lot where we were parked. After about 2 kilometers we decided it might not, and shorts and sandals were not appropriate attire for the trail conditions of moss covered rocks and thorn bushes. We came across an Etruscan tunnel carved through the hill side. At about 100 yards long and maybe five and a half feet high it was no surprise to find it had acted as a bomb shelter during World War II. We got back to the town square just as the sun was beginning to set, casting a beautiful, soft glow over the piazza. Karen talked with a woman in the square and I spoke with her husband. Relating horror stories of Rome and being ripped off continually, overcharged and short changed, it was quite obvious they were tourists not locals. I expect that sort of thing in big cities anyway, pretty much anywhere we go. I sat in the piazza, looking at the church and the tower in the glow of the setting sun, surrounded by cats and flies, feeling sorry for the cats as they ran up to me with a pitiful look in their eyes and a heart breaking mew, hoping I would feed them something. 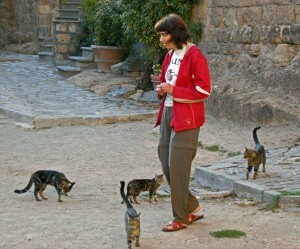 I could see the basis for a science fiction movie developing as these playful cats steadily surpassed the number of humans in the village in a matter of weeks. At our B&B there was a resident dog, a golden something or other, a nice mid-size dog. I was just commenting to Karen what a great quiet dog he was (I rarely say anything nice about dogs) when he stood up on the door stoop, bared his teeth, growled and commenced to bark up a storm. We let him get it out of his system, after all, he’s just protecting the house, then entered cautiously. The restaurant in the B&B was not fancy but was very nice; and I’m not saying that just because there was precious little choice of places to eat in town. Our meal was wonderful and, before he left, the owner gave us a bottle of wine. He didn’t even ask he just assumed that we wanted it. I, for one, will never question such a custom. After dinner we took a nice moonlight walk. As if 15 people was a crowd, at night the village is absolutely deserted save for us and the other couple staying in the B&B. Civita goes from tranquil to comatose in the dark. I am so happy I found this place. Our evening was topped off by being locked out of the B&B. The other couple was at the door when we arrived and we both had a key but none of us could get the lock to work. We were going to have to do something to get the attention of someone inside to let us in. Where’s that growling, barking dog when you need him? I guess we made enough noise trying to open the door and decide what to do that someone heard us and came down to let us in. It was very obvious when the Civitans arise; at 7 AM the church bells chimed which was kind of an interesting alarm providing you were not sound asleep at the time. In that case it can be a bit of a jolt as the church tower was right outside our window. Fortunately, they did not chime all night. Civita could be the town that time forgot but it is definitely a town resting on the brink of death as the land crumbles away; having lost a house and a church, they are prepared for anything. As we walked down to the parking lot I took one last longing look at this amazing town. It definitely registers a “best” for a truly unique setting and a wonderful ambiance.